I used the single pie crust recipe from my Mom's Better Homes and Gardens cookbook circa 1968, but here is a link to a single pie crust in case you don't happen to own a cookbook with a pie crust recipe in it. DO NOT OVERWORK the crust! Ok. Once I worked up my pie crust, I transferred it into a deep dish pie pan. I followed the directions for blind baking (which means stabbing the crust with a fork so it doesn't puff up and cooking it for about 12 minutes @ 375. you want your pie crust browned and "firm"). 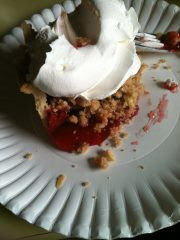 You do this so you don't end up with "soggy bottoms", as Julia Child would say. 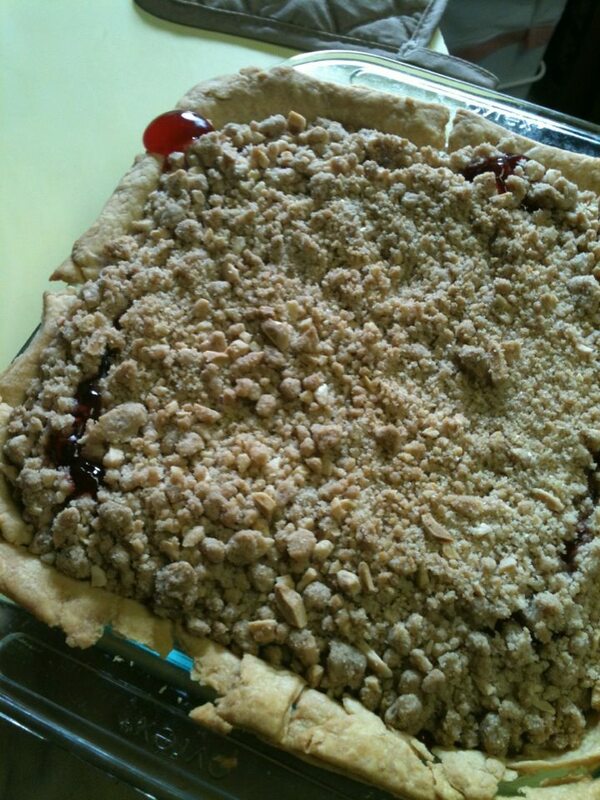 Once my pie crust was cooled, I poured my 2 cans of cherry filling in and covered with the crumble generously. I cooked the pie @ 375 for another 20-30 minutes or until the crumble was browned and the cherries were bubbly. Let it cool and serve with whipped cream or ice cream.